Considering a Disney theme park vacation? In the United States, you can choose between Disney World in Orlando, Florida, and Disneyland in Anaheim, California. While many people expect them to be interchangeable, nothing could be farther from the truth. Both destinations deliver plenty of Disney fun, yet there are many differences aside from their locations on opposite coasts. Take a look at how they compare. 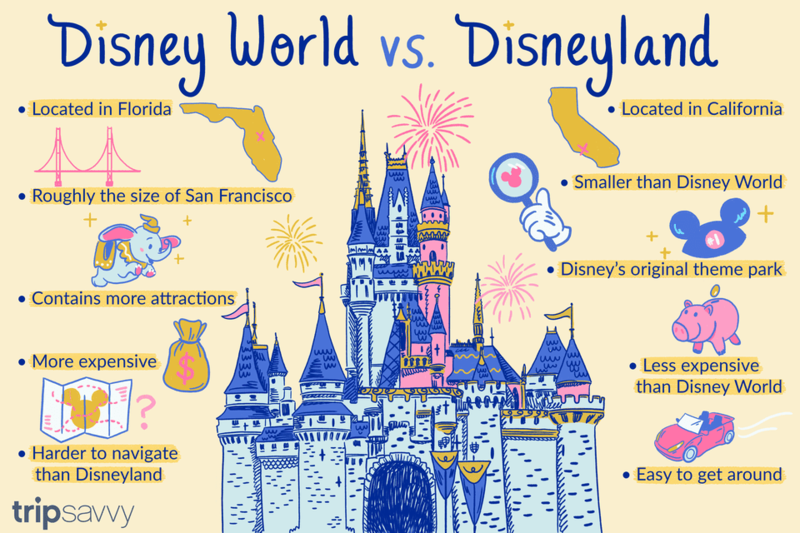 The biggest difference between Disney's two theme park resorts in the United States is size. You can't see all of Disney World in a single visit and shouldn't try. Instead, come up with a Disney World bucket list for your family based on your kids' ages and interests. As your kids grow up, your bucket list will change and you'll come up with new must-do experiences when you visit. Another major difference between Disney's two U.S. theme park resorts is their histories. As Disney's original theme park, and the only one built under Walt Disney's direct supervision, Disneyland Resort is the sentimental favorite of many Disney fans. The original park opened in July 1955, and Disneyland celebrated its 60th anniversary in 2015. Over the years the theme park has been expanded and renovated a number of times. In 2001, a second theme park, Disney California Adventure, opened on the site of Disneyland's original parking lot. Across the continent in Florida, Disney World opened in 1971. Walt Disney dreamed up the ambitious "Florida Project," but he died 1966 and never saw it open. 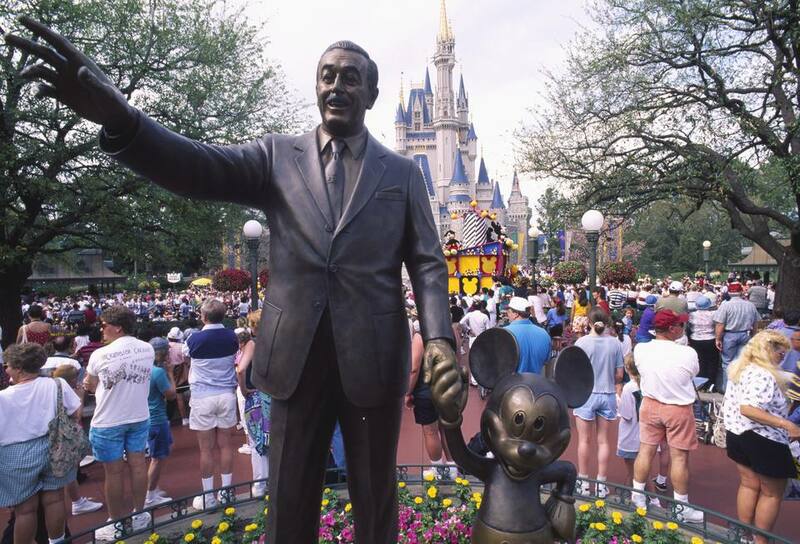 Walt's brother and business partner, Roy Disney, lived to see Disney World open but he died three months later. Disney World opened with one theme park and three hotels but has grown over the years to the size of a major city. Since the Magic Kingdom was based on Disneyland, the two parks are very similar in layout and share some—but not all—of the same attractions. Yet even when both parks offer the same ride, there are frequently​ differences. For example, the Splash Mountain and Pirates of the Caribbean attractions at Disneyland are longer and considerably different to the Disney World versions. When visiting either park, you enter at the Main Street railroad station and walk down Main Street U.S.A. toward 77-foot-tall Sleeping Beauty Castle at Disneyland or 189-foot-tall Cinderella Castle at the Magic Kingdom. At each park, the castle is the main hub, from which you can take paths to Fantasyland, Adventureland, Frontierland, or Tomorrowland. As you would expect given Disney World's much larger size, there are many attractions at Disney World that you won't find at Disneyland Resort. What might be less obvious is that there are also some key attractions at Disneyland that are not available at Disney World. At Disney California Adventure, for example, the entire Cars Land is unique to Anaheim. Ticket prices at Disney World cost slightly more than at Disneyland. In 2018, single-day tickets to Disney World's Magic Kingdom in regular season cost $119 for adults, while one-day admission to Epcot, Animal Kingdom, and Disney's Hollywood Studios cost $114 for adults. Children 10 and older pay adult admission prices, children ages 3 to 9 pay $113 at Magic Kingdom and $108 at the other three main parks. Admission is free for children under 3. Meanwhile, at Disneyland Resort, single-day tickets to Disneyland Park or Disneyland California Adventure Park now cost $117 for adults. Children 10 and older pay adult admission prices, while kids ages 3 to 9 pay $110. Admission is free for kids under age 3. At both parks, the per-day cost of tickets decreases when you buy a multi-day ticket. There has been a sea change in how you plan a Disney World vacation with the introduction of a new ticketing process called MyMagic+, which bundles nearly every aspect of your trip together. Instead of a ticket, you get a MagicBand, a rubber bracelet containing a computer chip that holds all the components of your Disney World vacation—theme park ticket, room key, dining reservations, PhotoPass—and it also acts as a resort charge card. FastPasses have been replaced by FastPass+, a digital version of the line-jumping system that can be managed from your smartphone. Thanks to its smaller size, Disneyland is a simpler vacation to plan. You'll need a place to stay, theme park tickets, and the paper FastPass system. Disney recently launched the official Disneyland app, which lets you buy your tickets, view wait times for attractions in Disneyland park and Disney California Adventure, browse maps, locate Disney characters, check show times, and more. While vast, Disney World is easy to get around via an excellent complimentary transportation system. Getting between theme parks and resorts generally requires a 10- to 30-minute shuttle on a bus, ferry, or monorail. Due to its smaller size, Disneyland is manageable without bus shuttles. The hotels are within walking distance of the theme parks, and the entrance gates to both parks are separated by about 100 yards. The Disneyland monorail travels between Tomorrowland in Disneyland Park and the Downtown Disney shopping and dining district. For the best time to visit a Disney park, take into consideration a combination of weather, crowds, and prices. Whether you visit Disney World or Disneyland, you can get your fill of Anna and Elsa from "Frozen," as well as other favorite Disney characters. Disney Parks always has something new in the pipeline. Here's a look at what's coming next to Orlando and Anaheim. Can You Name Disney’s Iconic 4 Rides at the NY World’s Fair?